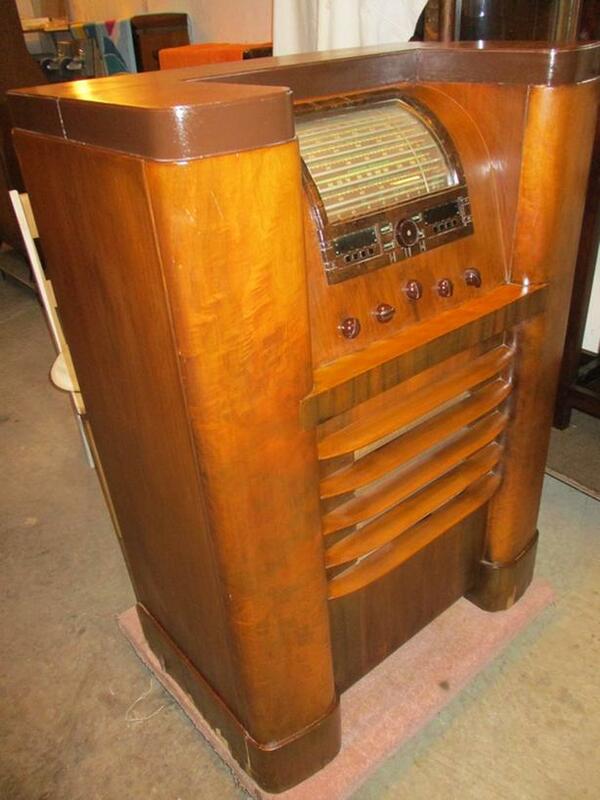 THIS IS A RCA VICTOR FLOOR MODEL RADIO. IT IS 29 1/2 INCHES WIDE, 18 INCHES DEEP AND 43 INCHES HIGH. THERE ARE 7 BANDS SHOWN ON THE DIAL CONTROL WITH 6 ORIGINAL TURNING BUTTONS. THE SPEAKERS ARE BEHIND A SEALED COMPARTMENT LABELLED MAGIC VOICE. A LABEL READS: RCA VICTOR RADIO MODEL 816K RANGE 530--- 21750 KILOCYCLES. MADE IN CANADA RCA VICTOR CO. LTD. MONTREAL CANADA. THIS SET IS DESIGNED FOR AND EQUIPPED WITH GENUINE RADIOTRONS. IT IS SERIAL NUMBER 321, MODEL 816, 200 WATTS. A LABEL SAYS: CAN ATTACH A MODEL R93 RECORD PLAYER TO MAKE A FINE PHONOGRAPH OF THIS RADIO. PLUGGED IN IT LIGHTS UP BUT NO SOUND WITHOUT AERIAL.